Books are for the scholar’s idle times. When he can read God directly, the hour is too precious to be wasted in other men’s transcripts of their readings. But when the intervals of darkness come, as come they must, — when the sun is hid, and the stars withdraw their shining, — we repair to the lamps which were kindled by their ray, to guide our steps to the East again, where the dawn is. This advice from my beloved New England sage I have taken seriously throughout my adult life. As a schoolteacher, at least one idea begins percolating in my consciousness while getting ready to go to work every morning. That way, if the classroom dynamics are flat, I have something going on in my head worth exploring that makes the day better, anyway. But this morning, of all rare times, nothing came. And as I moved through my classes, it never did come. Now that I am into my Friday night, with a welcoming weekend stretched out before me, I still have no idea to pursue. Following Emerson’s dictate, I now have a stack of quality books at my elbow. But before opening one of the volumes, I was struck by the thought: “Hey! You haven’t drawn or painted today! Do it.” But I didn’t feel like it. I did it anyway, and the drawing is posted above. Things are already looking up, and I am ready to read and relax into the rest of the night now. If nothing happens tonight, I’m confident that I’ll wake up with an Idea tomorrow. Texas has been cold, dark and rainy the entire day. 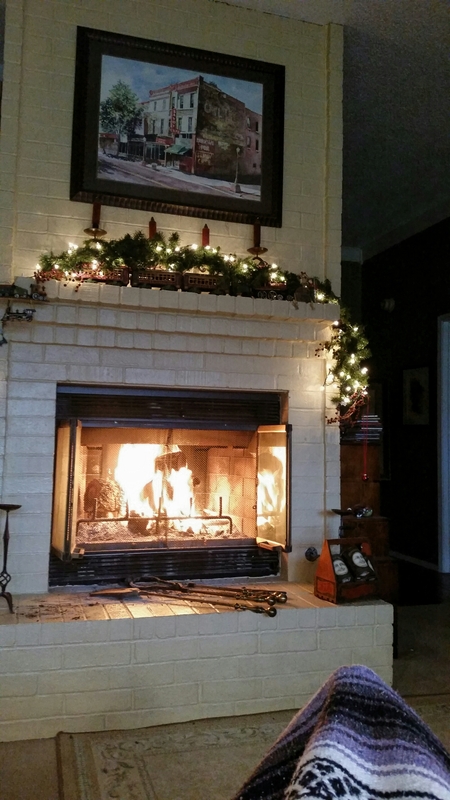 Once home from school, I built a nice fire, brewed a pot of coffee and then got under the blankets in front of the fireplace and read with a glad heart. My imagination has been fueled by an article I read today in Culture that popped up on my facebook: “The Death of the Artist–and the Birth of the Creative Entrepreneur.” I found the article very engaging, as it traced the history of the artist, from artisan to genius to institution to our current digital age of entrepreneurship. Some of it could have been disturbing, but it rang true, and provoked me to think soberly about what I’m attempting to do at this point in my life. After I read the article, I turned to something I had heard about my entire adult life but never once read: Arthur Miller’s play “Death of a Salesman.” What a probing, sober-minded piece of work! The rest of the afternoon found me thinking and scribbling in my journal. 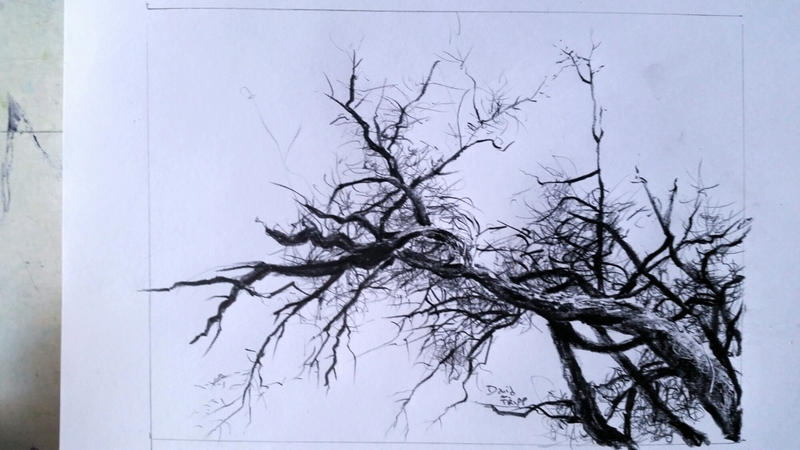 I’m still intrigued by the tangle of winter trees, and never seem to tire of their twisted, gaunt anatomy. When the Day is Jammed . . . There are times like this day, when the public school schedule is so jammed with details, that one cannot find quality moments even to think, but just react. So . . . I decided to see what I could do during the mindless passing periods between classes (about seven minutes). Even when one has seven minutes here and seven minutes there, opportunities for sanctuary still present themselves. And so I retreat into the start of another drawing, with delight, knowing I could always finish the piece tonight in the studio, or tomorrow night, or . . .
Not I, not I, but the wind that blows through me. I suppose that is about the best way I could describe my feelings when I am seized with the impulse to make art. All day today at school, I could only think about returning to this watercolor I started recently, and I couldn’t get to it till late, late afternoon. But once I got down to it, everything else in my life seemed to melt away, and I got to the point where I wasn’t even thinking about what I was doing as the brush continued to move. For me, that is often what happens when watercoloring or drawing. Once the watercolor got too wet and soupy to continue working on it, I set it aside and took out another photo I took recently of a tangle of trees in my back yard. I didn’t stay with this one very long until I got sleepy. But still, there are moments when my hand is moving, the pencil seems to be having its way, and I’m no longer thinking about what I’m doing. I like that feeling. Motherwell is ruefully aware that the “Elegies” are regarded by some as a formula. (“When he gets stuck, what should he do but make another ‘Elegy’?” he quotes one critic as saying). Grace Glueck, “The Creative Mind; The Mastery of Robert Motherwell,” The New York Times, December 2, 1984.
. . . the reason I’ve made so many of whatever I’ve made that could be called a series–because I detest serial painting–is simply because I feel that I’ve never really solved any of them, and so they remain a challenge. The day I can make an Elegy that really satisfies me, then I’ll stop. In the past month or so, I have become absorbed with drawing. Throughout my artistic life, I have believed in my heart that drawing is fundamental to art, and yet have felt like a hypocrite, because I have always drawn so little. Finally, I am obsessed with the practice of drawing. 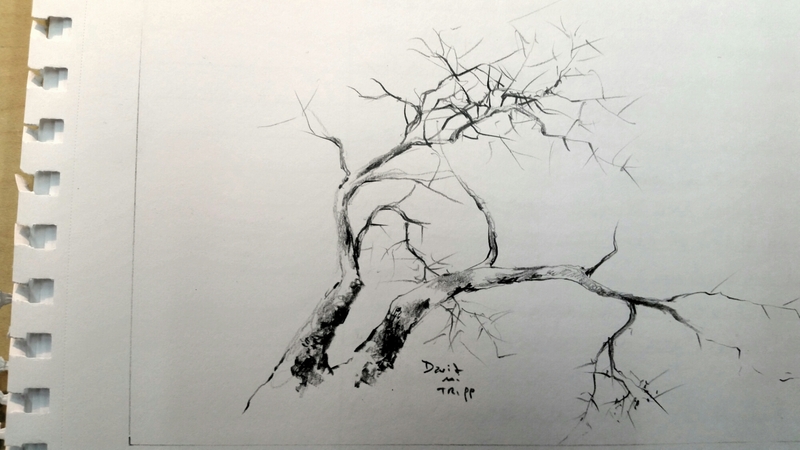 And for many years, I have stared at the anatomy of trees in the winter, when they are so exposed and accessible to the naked eye, yet never pulled the trigger in deciding to fill up sketchbooks with tree drawings. That has changed. Tree boughs are not silhouettes; they have a range of tones. In watercolor, the tree’s wood is not uniform throughout in color and value. Tapering the boughs and limbs, for me, is extremely difficult and requires much concentration and repeated checking. 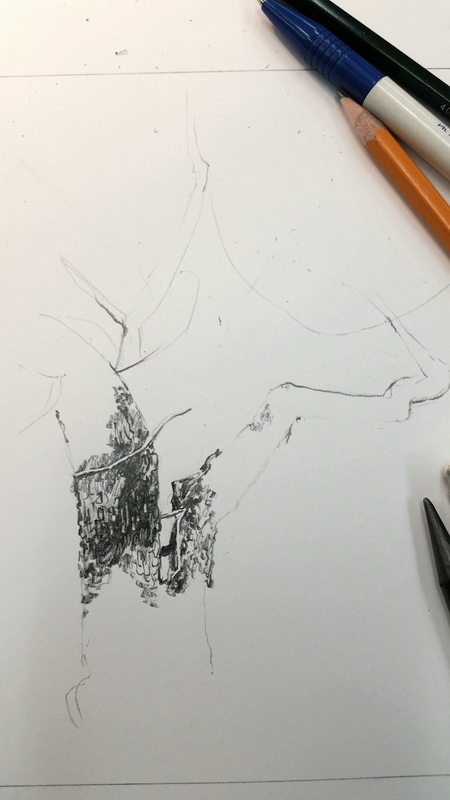 The snarls of twigs are similar to scribbles with the pencil. There are always more twigs at the ends of the tree that I tend to notice in early glances. I do not want the tree to look badly pruned. I must taper the twigs all the way to the point that they nearly disappear into the sky. My attempt at watercoloring the tree tops in my back yard is coming along much more slowly than the drawings, but I’m happy in the struggle. While gazing heavenward through the tops of winter trees, I note the complexity of limbs partitioning the sky, as lead tracings in stained-glass cathedral windows partition theology. There is plenty of schoolwork to accomplish this Sunday, but I’m trying to put in some quality studio work as well. I completed a 5 x 7″ drawing of the tree tops in my back yard. 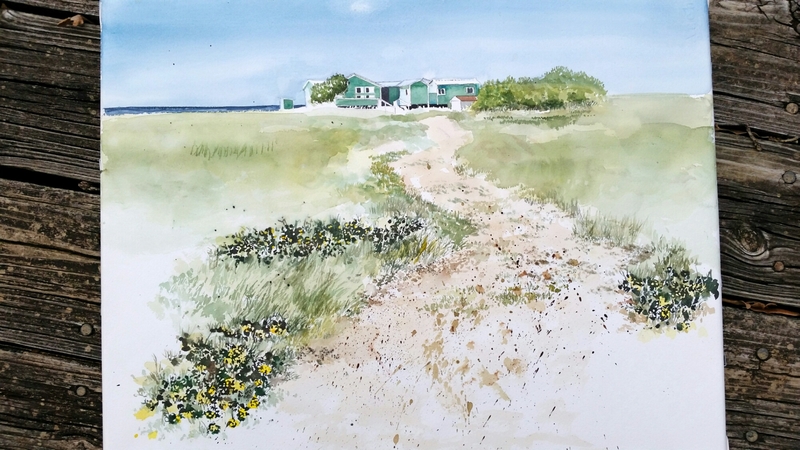 I have also begun an 8 x 10″ watercolor of the same composition. As Texas temperatures drop to around forty tonight and into the twenties over the weekend, I stacked the firewood in delightful preparation for a cozy weekend at home. School went very, very well this first week of the spring semester, and I celebrated by preparing one of my favorite meals. Now I retire happily to my favorite piece of furniture in the house and spend quality time writing and digging into the delicious literary works from authors that drive my imagination (lately Joyce, Shakespeare and Marvell). The philosophy and art history classes this past week have lit a fire beneath me, and I’m grateful for time and space to explore new avenues. 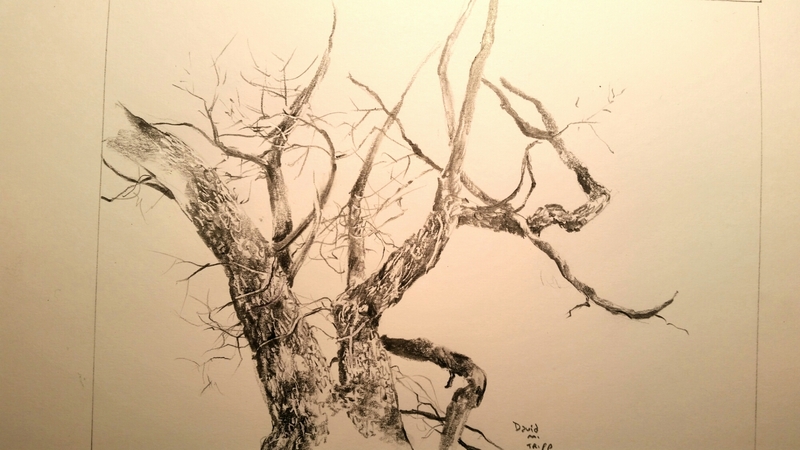 I am re-posting this tree drawing I did early this morning before school, when things weren’t going as great. I think drawing did a great deal to lift me into better spirits. In many times, art has been a healing friendship that has improved my outlook on this world.